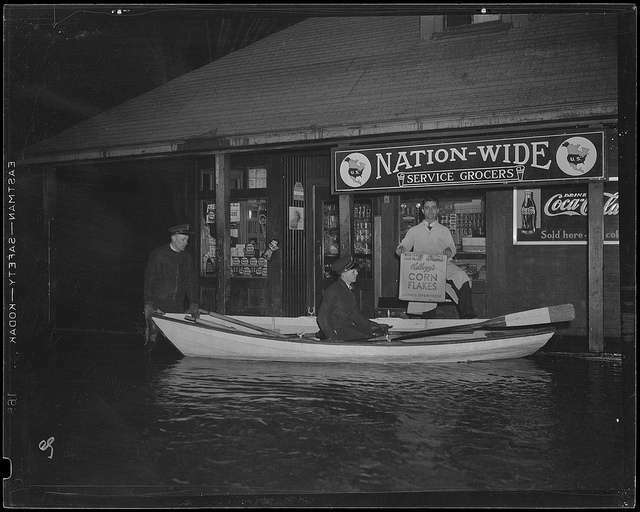 The great 1936 flood began on March 11 with a downpour in New England that didn’t stop for 14 days. The rain then unleashed a flood that covered half of the Eastern United States. Pinkham Notch in New Hampshire recorded 22.43 inches of rain over the period. 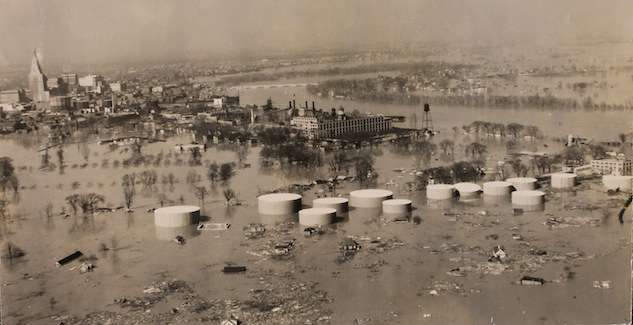 Hartford underwater during the 1936 flood. Photo courtesy Library of Congress. Nobody in New England had ever seen anything like it. And nobody ever would again. During two rainy weeks, the United States experienced two consecutive downpours, among the largest and heaviest in history. And then a third downpour prolonged the destruction and misery. Rivers turned into raging torrents from New Hampshire's notches to the Long Island Sound. The Androscoggin rose to record levels in Auburn, Maine, and so did the Merrimack in Lowell, Mass. Also reaching never-before-seen heights: the Pemigewasset in Plymouth, N.H., and the Connecticut in Dalton, N.H., Montague, Mass., Hartford and Thompsonville, Conn. The 1936 flood burst dams, wiped out roads, ruined businesses and washed away homes. As many as 200 people died and 14,000 left homeless. The disaster prompted Congress to act. On June 22, 1936, President Franklin D. Roosevelt signed the Flood Control Act of 1936. It empowered the Army Corps of Engineers to build hundreds of miles of levees, flood walls and channel improvements. The Corps dammed approximately 375 new major reservoirs. …saved billions of dollars in property damage and protected hundreds of thousands of people from anxiety, injury, and death. They stand today as one of the more significant marks of our technical skill and humane spirit. 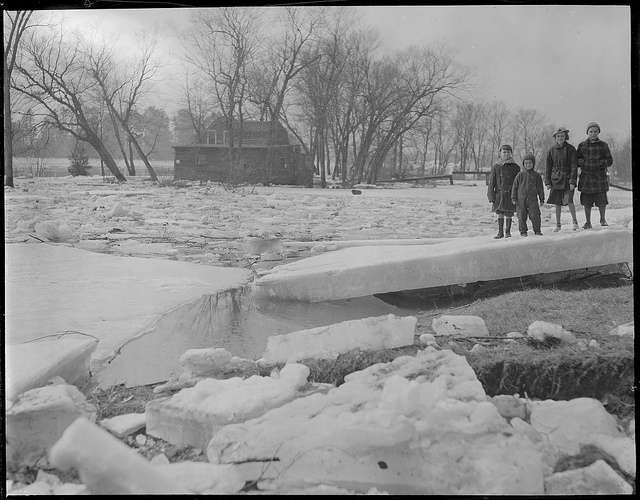 Ice did much of the damage during the 1936 flood. Photo courtesy Boston Public Library, Leslie Jones Collection. The worst possible weather combined to produce the 1936 flood: A warm front that stalled on March 11 followed an unusually cold, snowy winter. With that warm front came the first storm, centered on the White Mountains. It lasted until March 13 and dumped five inches of rain onto Maine, New Hampshire and parts of Vermont. 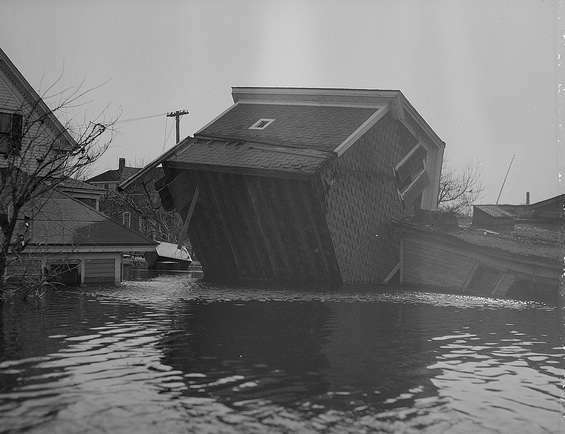 Weather forecasters had accurately predicted the 1936 flood, and ample warning prevented much loss of life. Ice jams on rivers caused most of the destruction. The 1936 flood laid waste to mills, homes, factories and highway bridges. A tremendous volume of snow melt and rain water poured into ice-blocked channels of rivers and tributaries. Ice carried away bridges over the Kennebec and the Androscoggin rivers and washed out mills and railroad tracks in Maine near Bethel and Rumford. Ice sheared off a 5,000 sq. ft. section of granite from the Holyoke Dam. The Maine Central Railroad did manage to save its bridge above the Great Falls at Lewiston-Auburn by positioning cars full of gravel on it. A second series of torrential downpours from March 16-19 swelled the Merrimack and Piscataquog rivers. Eighteen feet of water flowed through downtown Hooksett, N.H., sweeping away utility poles, barns, houses, schools, stores, roads and railway embankments. In Nashua, N.H., the Souhegan River flooded factories and homes with eight feet of water. Families were evacuated by boat. Manchester, N.H., was also underwater. Police worked around the clock evacuating families from their homes, snatching some from rooftops as the Merrimack washed away houses. The governor activated the National Guard to help police. The animal trainers at the zoo in Manchester had worked through the night of March 18-19 to save the animals, carrying small creatures across the road to a safer building. They bodily lifted two bears and two leopards to the top of their cages. But by 7:30 a.m. the waters had risen so fast the zookeepers took refuge on the building’s roof. As ice and debris battered the flimsy building, police spent hours trying to rescue them. Finally two civilians in a boat managed to row one, then the other to safety. The 1936 flood badly damaged the giant mills owned by the bankrupt Amoskeag Industries, washing away any hope that the company could revive. The Union Leader proclaimed, “Disaster and Death from Mountain Notches to the Sea.” In New Hampshire alone, 87 cities and towns suffered flood damage. In Williamstown, Mrs. Hiram S. Drury dropped dead on March 18 as she watched raging flood waters pour through a ruptured dam. A six-mile ice-jam on the Connecticut River burst through a hydropower dam in Vernon. State police ordered the valley evacuated. Two children, 5 and 7, were washed away by a swollen stream as they crossed a footbridge in Hancock. Harold Smith, a father of 12, drowned while trying to divert floodwaters from the lumber mill that employed him. 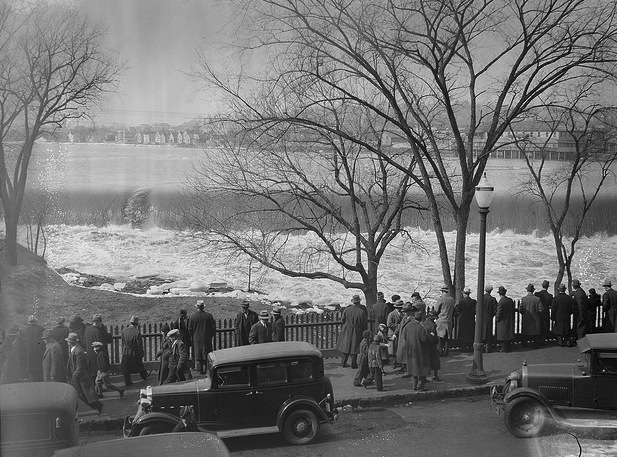 People watching the Merrimack River in Lawrence, Mass., during the 1936 flood. Photo courtesy Boston Public Library, Leslie Jones Collection. The Merrimack floodwaters damaged mills from Manchester and Nashua in New Hampshire to Haverhill, Lowell and Lawrence in Massachusetts. The river rose 68 feet in Lowell, destroying businesses along the northern banks. Jack Kerouac’s father Leo lost his print shop to the floodwaters. The disaster consigned him to poverty and alcoholism. In Andover, Mass., the Shawsheen rose halfway up first floor windows, and residents evacuated by canoe, motorboat and rowboats. The power went out for days, and doctors volunteered to immunize hundreds of residents against typhoid at the American Legian hall. Amherst College President Stanley King got a phone call from a town selectman at 11 pm on March 18. The raging Connecticut River forced evacuation of the towns of Sunderland and Hadley. Massachusetts College had already agreed to take Sunderland. Would Amherst take Hadley, he asked? Within two hours, cots and blankets were set up in the Amherst gym. The athletic director organized faculty and students with cars to drive the evacuees to the campus. And faculty wives staffed the cafeteria, making coffee and food for the flood victims. Few of the Hadley residents spoke English, so Polish-speaking students interpreted for them. Students played with the children and entertained them with music. They stayed for nine days. Downstream in Connecticut the Connecticut River flooded its banks along with the Farmington River. A 200-foot-wide dam in New Hartford, Conn., burst, releasing 8 million gallons of water and isolating the village of Satan’s Kingdom. Residents of the Farmington Valley had to flee for their lives. Property damage from the 1936 flood was tremendous. Photo courtesy Boston Public Library, Leslie Jones Collection. Connecticut River floodwaters rose 38 feet in Hartford, a record that still stands. Food and medical supplies were stored at Hartford High School for safety, but had to be moved as the floodwaters rose relentlessly. Southern New England Telephone’s central office on Trumbull Street was flooded with 20 feet of water. Firefighters tried to pump out the company’s building on Jewell Street, but abandoned their steam pump to the rising waters. National Guard units patrolled the Hartford city streets along with the Coast Guard and police, rescuing citizens in rowboats and taking them to temporary shelters. Not a single phone in the city worked. Switchboard operators came to work by rowboat to restore phone service. They then had to walk along an emergency catwalk from one building to the next. The power went out, and surgeons performed operations at Mt. Sinai hospital under battery-powered searchlights. At the Bond Hotel, guests checking out were rowed from the staircase to the desk to settle up and then floated to the railroad station. 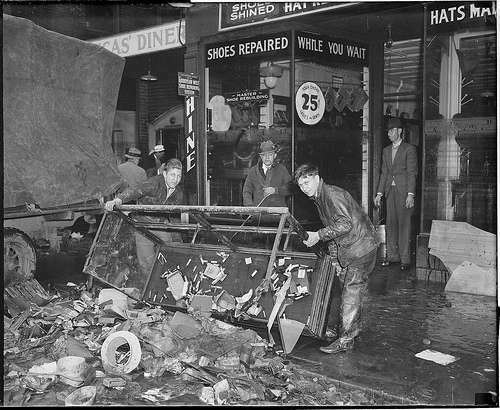 The 1936 flood wiped out many small merchants. Photo courtesy Boston Public Library, Leslie Jones Collection. When the floodwaters receded, buildings appeared in the middle of the street, barns upended and houses far from their foundations. The flood wiped out many small businesses, and it destroyed pews and altars at St. Anthony’s Church in downtown Hartford. On March 24, a 28-year-old Hartford man, Charles Serafini, stepped into a deep pit on Van Dyke Avenue and drowned. By then, the monumental cleanup of the 1936 flood had begun. Cellars were pumped out, buildings were inspected for safety and tons of debris were hauled away. Workers dynamited debris that collected next to the highway bridges. 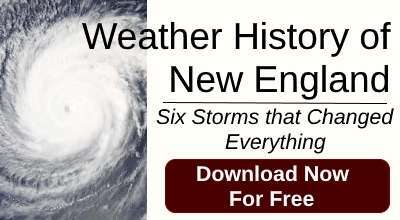 Hartford is slowly recovering from the most terrifying and spectacular experience in its history – a flood, the vivid impressions of which will live forever in the memories of those who saw and went through it. This story about the 1936 flood was updated in 2019. Yes I bet this is the fact that it only happened once in her lifetime of almost ninety years and now things like this are happening in other parts of the world are a certain sign of climate change. The vast majority of scientists agree. Have you seen how the glaciers are melting? Cool article, thanks NEHS for posting. Regarding global warming comments, I just want to be sure that we’re having the correct debate. Not a single person is denying that the earth is warming up, it’s a scientifically observed and recorded fact, unless you don’t believe in the genuine workings of a thermometer. Here’s an article from our nations weather experts that shows the warming: http://www.ncdc.noaa.gov/paleo/globalwarming/instrumental.html. The only debate that people are having is whether this warming of the earth is man made or not, which is harder to determine because when we observe the earth’s temperature over a longer period of time, we can see that the earth’s temperature has always fluctuated naturally, here’s another graph showing a longer time period: http://hyperphysics.phy-astr.gsu.edu/hbase/thermo/templine.html. What’s important for us as a nation and a global community is to is to make sure we are best prepared, from a planning and infrastructure perspective, to withstand the impact of this warming period. That’s what the Navy is doing, see article here http://www.scientificamerican.com/article/us-military-forges-ahead-with-plans-to-combat-climate-change/. Many of our nations early history floods and flood damage were a result of not having adequate infrastructure to prevent them, over the last 70 years the Army Corp of Engineers has established more robust flood control systems. As scientifically observed water levels continue to rise, see here: http://tidesandcurrents.noaa.gov/sltrends/sltrends.shtml we will need to continue to spend more time and money preparing for those higher water levels. The last time the world was incurring a warming period was a thousand years ago and the architectural landscape of our river and ocean coasts in the US were non-existent, today we have more at stake. To conclude, global warming and rising water levels are unquestionably happening, there’s no consensus about what’s causing it or how long it’s going to last, as a species we would be smart to do what we do best and adapt to the changing circumstances. I noticed two geographical errors. The Nashua River flows through Lancaster Massachusetts not Lancaster New Hampshire and the Souhegan River doesn’t flow through Nashua. Pingback: Manchester, New Hampshire: A city with an identity crisis | My thoughts...exactly. my grandfather died during this flood….matthew foley husband of Christina.his childrend are matthew,madeline,Richard,John,Ann,Francis,Grace-Helen FOLEY. They lived on NELSONS FARM. All info welcomed!